Home Dressage Why Do We Do This? For Successes Like Squishy’s! Why Do We Do This? For Successes Like Squishy’s! 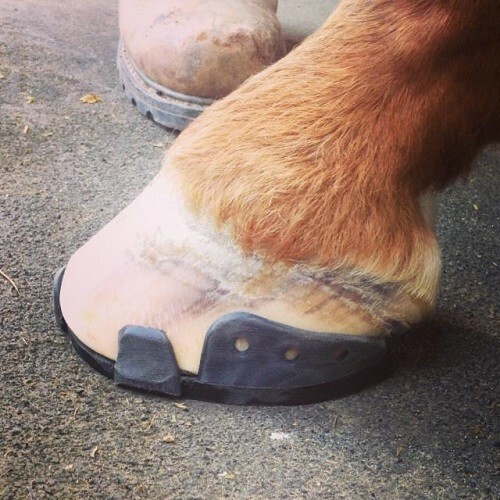 After 21 years of making hoof protection for the equine industry there are certain moments that have grabbed my attention and make everything worth the hard work and effort. The majority of these memories contain emotional moments from owners and horses doing things only seen in their younger years. Squishy grabbed my attention in a big way on January 19th, 2014 when he went into his first set of EasyShoes. Although the application was different there wasn't a great deal of hope the EasyShoes would last longer than a couple days. 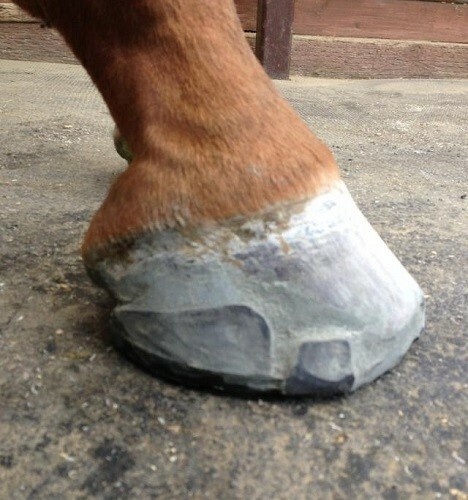 Squishy had been the hoof professionals worst nightmare in the past and no form of hoof protection lasted more than a couple days. A couple days after the first application I received the following text from Shannon Peters: "The most amazing thing is that in five years, he has not tolerated anything on his foot for a prolonged period. So the fact that this is the fourth day in these and he is getting better is a miracle". Shannon Peters and Squishy in EasyShoes. Squishy in his first set of EasyShoes. Only the vertical tabs are glued. No adhesive is used on the sole for his application. Appplied by Ernest Woodward Farrier. 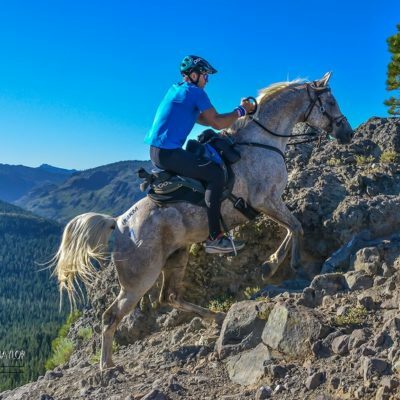 "Squishy is a fourteen year old Westfalen Gelding that I have owned since he was five. He always had sensitive feet, particularly to a trim, and has never grown a lot of foot. 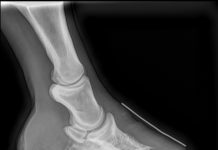 He had an initial laminitic event in 2008, from being trimmed too short on both front feet. He recovered from that and was on a continual rotation of different shoes to try and keep him comfortable. I started keeping his shoes off in between shoeings, and he was becoming more sound without shoes than with. I took him to Gladstone, New Jersey in June of 2009, to ride in the Dressage National Championships (wearing Sigafoos Series 1). He contracted Lyme disease there and unfortunately because we don't really see Lyme in Southern California, he went undiagnosed until December of 2010. He has had laminitis four times since then. He also is borderline Cushing's/IR. Enter Sossity and Mario Gargiulo!!! 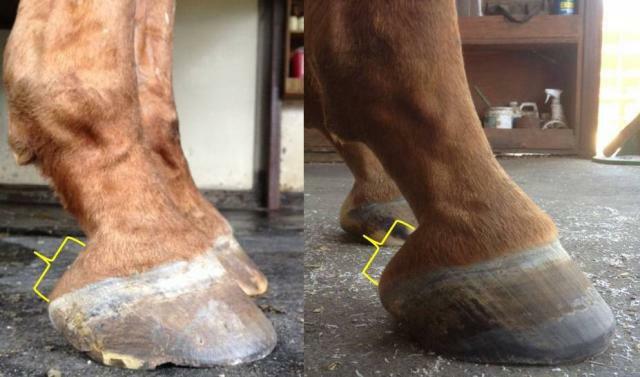 They have worked miracles on his feet in the last two and a half years. 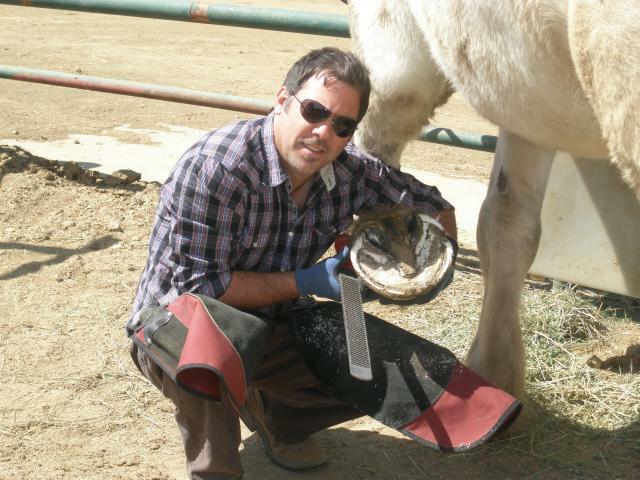 They have kept him sound and gotten him through laminitis four times, a miracle in itself." Sossity's and Mario's amazing progress in the first year. Change in digital cushion from February to July. Sossity and Mario have maintained his trimming. 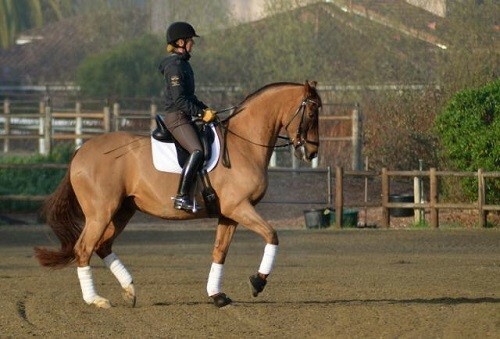 "He has had several months over the last five years that I have been able to ride him, either barefoot or with Easyboot Gloves, but every time he had a laminitic event, we were back to square one trying to recover his feet. He has always been a horse that tends toward long toes, low heels, and thin soles." Mario Gargiulo adds his signature finish to Squishy. "The first of this year he was doing pretty well – working barefoot and fit and healthy. Then his soles dropped. I called Sossity and asked her if we could try the EasyShoe, as he was so sore he was having difficulty walking on hard ground. Ernest put the first set on and he was immediately better. A few days later we added the Caudal support with the Xsoft, and that really made him even more comfortable. 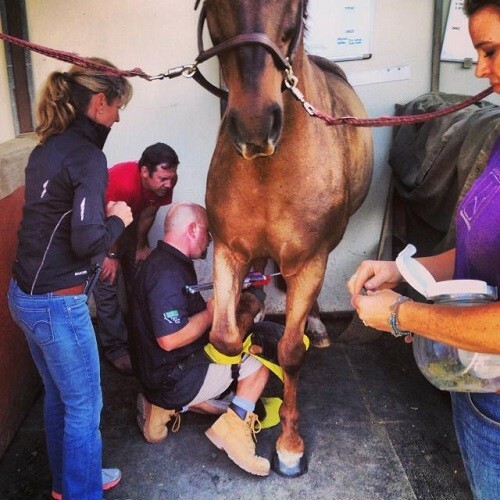 This was a huge surprise to all of us, because historically, he has not tolerated anything on his feet but an Easyboot Rx when he has gotten sore." vertical tabs are glued on Squishy to prevent any possible sole pressure. jump in to help with the Squishy Technique (vertical tabs only). "Squishy is now on his third set of EasyShoes, and this is the first time in five years that he has not had under run heels at the end of the trim cycle, and he is building a calloused sole. We actually had to take his heels down a bit this trim, which was a first EVER!!! He is also standing very square on his heels directly under himself, which he used to very rarely do. He is working every day, and is actually growing a healthier foot." The appreciation between Shannon and Squishy is mutual! 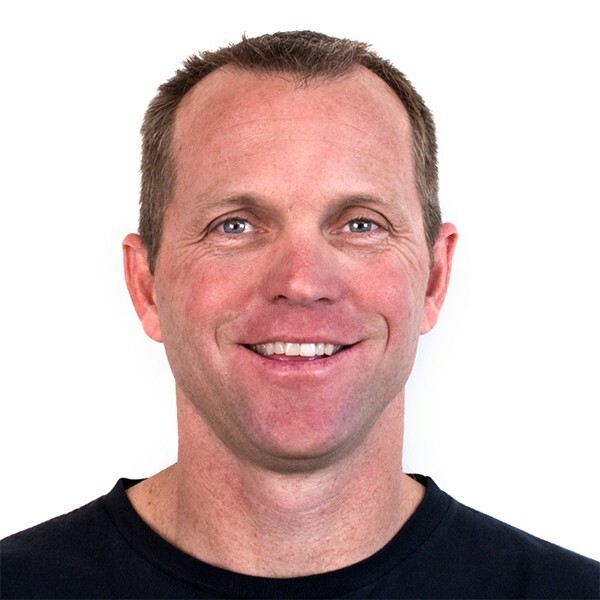 Mario Gargiulo asked me during a run what my goal ultimate goal was at EasyCare, why do I do it? As we huffed up the hills I thought about it for a moment as I caught my breath. Horses like Squishy are why I do it. Owners like Shannon are why I do it. If you are interested in learning more about the EasyShoe, it's application and why it's unique, we encourage you to attend one of our EasyShoe Clinics. 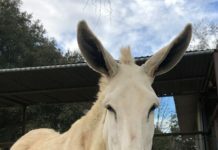 Each 2 1/2 day clinic schedule starts on Friday evening and will focus on hoof anatomy, background on the EasyShoe and hands-on application techniques of all four shoe models. Space is limited so make sure to reserve your spot today. Participants may sign up using this on-line form: EasyShoe Clinic Registration. Please contact Daisy Bicking with any questions at Clinic@DaisyHavenFarm.com. Our next clinic will occur May 16-18th in Charlotte, NC. A horse is the projection of peoples' dreams about themselves – strong, powerful, beautiful – and it has the capability of giving us escape from our mundane existence. Previous articleTrail Riding, How Hard Can It Be?